Now that’s how you win a final. 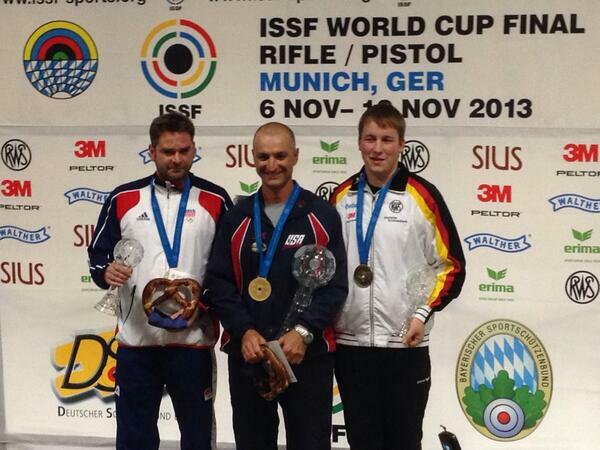 Emil Milev kicked off the first day of competition at the ISSF World Cup Finals for Rifle and Pistol in Munich, Germany in the best way possible for the United States – by picking up his first World Cup Finals title in the Rapid Fire Pistol event. Milev (Temple Terrace, Fla., pictured center), shooting against the top-10 competitors in the world in this event, qualified for the final in the last, sixth position by shooting a 575 in qualification. No matter - with the new rules for finals by the ISSF in place, all finals competitors enter the finals match on equal footing. After the first competition stage of finals, Milev was tied for third with 10 hits. In the second competition stage however, Milev moved to the top of the pack shooting a 4-5-5-4 in the subsequent four, five-shot series. He later sealed his win with a perfect five hits on the final series. His win is just one hit behind the world record. World Cup Final title defender Martin Strnad of the Czech Republic took silver and 2008 Olympic bronze medalist Christian Reitz of Germany took bronze in the event. At the conclusion of the World Cup series each year, the best eight athletes in each event with the highest qualification values qualified for the ISSF World Cup Final. Qualification points are earned through ranking and in relation to the score(s) shot by the athlete at each World Cup. Additional “wild card” slots are also awarded to title defenders and Olympic Games medalists of the previous year. Milev, a five-time Olympian, picked up his 15th career World Cup medal with a bronze-medal finish at World Cup Granada in the Rapid Fire Pistol event. The points earned from his bronze medal in addition to his first-place finish in qualification assured him a spot in these World Cup Finals. Milev’s U.S. teammate Keith Sanderson (Kailua, Hawaii) finished in eighth place, shooting a 566 in qualification. Up next for the U.S. team is Dempster Christenson (Sioux Falls, S.D.) who will shoot in the Men’s 10m Air Rifle event Saturday. For complete results from this event, please visit the ISSF website.